Almighty and everliving God, whose servant Thomas Cranmer, with others, did restore the language of the people in the prayers of thy Church: Make us always thankful for this heritage; and help us so to pray in the Spirit and with the understanding, that we may worthily magnify thy holy Name; through Jesus Christ our Lord, who liveth and reigneth with thee and the Holy Spirit, one God, for ever and ever. Almighty and everliving God, whose servant Thomas Cranmer, with others, restored the language of the people in the prayers of your Church: Make us always thankful for this heritage; and help us so to pray in the Spirit and with the understanding, that we may worthily magnify your holy Name; through Jesus Christ our Lord, who lives and reigns with you and the Holy Spirit, one God, for ever and ever. 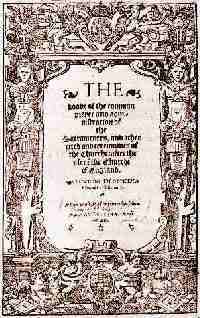 In 1549, under the reign of Edward VI, successor to Henry VIII, the primary language of public worship in England and other areas ruled by Edward was changed from Latin to English, and the first Book of Common Prayer came into use. It was first used on Pentecost Sunday, 9 June 1549, and the occasion is now commemorated "on the first convenient day following Pentecost." The Book was the work of a commission of scholars, but primarily of Thomas Cranmer, Archbishop of Canterbury. It was based primarily upon the Latin worship tradition of the Use of Sarum (similar to, but not identical with, the Roman rite used by most Roman Catholic between 1600 and 1950), with some elements taken from the Greek liturgies of the Eastern Church, from ancient Gallican (French) rites, from the new Lutheran order of service, and from the Latin rite of Cologne. The older usage had grown haphazardly through the centuries, and had added so many complications that it was difficult to follow (the priest often needed to juggle up to a dozen books to get through a single service). The new order pruned and simplified so that only one book other than the Bible was necessary, and so that even the laity could follow the service and participate without difficulty. Moreover, the quality of the English was outstanding. All Christians who worship in English, from Roman Catholics to Southern Baptists and beyond, are in some measure influenced by it, and all to whom it is important that the people of God understand the worship of the Church and take an active part therein have cause to be grateful for the Book of Common Prayer. At the time, it had its drawbacks. It was resented in non-English-speaking areas ruled from London, such as Ireland, Wales, and Cornwall. If a Gaelic version had been produced simultaneously, the religious history of Ireland might have been radically different. As it was, the Prayer Book and the English Bible were viewed as part of an attempt to impose the English language upon Ireland. Similar sentiments were common in Wales and Cornwall, but with less drastic consequences.